Tattoos are personal expressions that last a lifetime. They can be an affirmation, a bold statement of love, a memorial, a motivational reminder - a personal statement of what truly matters to you. And this is why it is so important to work with a tattoo designer that will strive to create exactly what you want. To begin, simply let us know what you want the tattoo to say. This is as easy as filling out the description above and submitting the order. Once your order is placed, we start by working on options for the translation. We explain these options and allow for as much explanation and detail as you need to be sure the translation is exactly what you want. Often we combine this step with initial samples as the translation often affects how the design will look. So by seeing both in this initial step you can make an informed decision on how to proceed. The initial samples are hand-brushed by Master Takase in a variety of fonts and layouts. Or if you have a specific font group in mind you can mention this and the initial set would focus only on that font group. So the first set of samples normally includes options for the translation, fonts, and layouts. With this in hand, you can make an informed decision on how you would like to proceed. And based on your feedback, Master Takase will rework the designs focusing on all of your preferences. And in this way proceed to the final design that is exactly what you want. Normally two or three sets of designs are needed to arrive at this final design. Once the final design is selected, we complete the design and create the line art (sometimes called a stencil) that your tattoo artist will need to properly ink the design. And we then email you the completed design. You will then have everything you need to take to your tattoo artist to get the design inked. If you would like to learn more about the process or see examples of Master Takase's work visit Custom Japanese Tattoo Designs. A custom tattoo can be fun, informative and completed in just days. 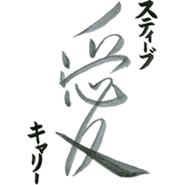 Work directly with Master Japanese Calligrapher Eri Takase to create an authentic Japanese Tattoo that is just for you. With over fifteen years of experience and with many thousands of satisfied clients, Master Takase is the perfect partner to work with. She is often praised not only for her exquisite artwork but also for her approachability, courtesy, and professionalism. Work directly with Master Calligrapher Eri Takase to create a purely custom work. This final artwork is on hand-made Japanese paper and is ready to be framed. Love Express the love you share. 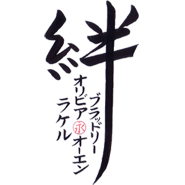 With Master Takase create a custom Japanese tattoo that personally expresses your love.